But, as Charles Forman, quadcopter hobbyist and founder of OMGPop, said in a recent post, they make up for it by being really effing cool. Guided by remote control, they’re not too different from the RC helicopters you might remember from your childhood. But with four propellers and hackable frames, they’re sturdier and more liberating than any RC. And as technology startups continue to harness them for futuristic tasks, they’re getting more and more buzz. Although U.S. regulations will prevent commercial quadcopter use until 2015, piloting as a hobby is enjoying a renaissance. If you’re interested in operating one of these innovative new bots, here’s an overview of a few of the most original choices out there. A Hex Airbot assembled with four rotors. 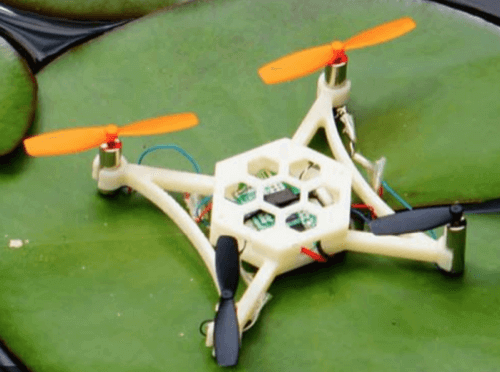 Crowdfunded, smart-phone operated, and 3D printed—this tiny copter’s description reads like a list of buzzwords designed to make a tech industry tastemaker salivate. Unlike the other copters on this list, which are quadcopters, the Hex Airbot can have up to six rotors depending on how the owner assembles it. It began as a wildly popular Kickstarter. Its creators asked for $10K; copter enthusiasts ended up giving them $500,000. The success probably results from the Hex Airbot’s hackable nature. It’s Arduino compatible as well as iPhone and Android compatible.  Plus, its software and hardware are open source. Its great for hackers who are just as excited to build the bot as they are to fly it—because it takes a lot of assembly before it’s ready to fly. 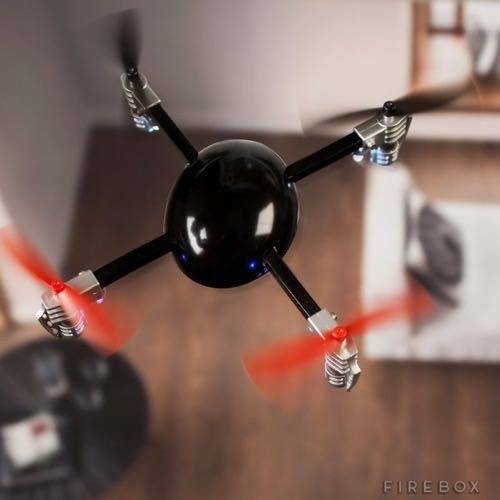 The Hex Airbot comes in three increasingly accessorized packages which cost $49 to $159. An Ardrone Parrot equipped with a Styrofoam hull. Perhaps you’ve heard horror stories about quadcopters colliding with humans, like when one hit a groom in the head at his wedding. But there’s nothing to worry about with the Ardrone Parrot, which comes with a Styrofoam hull which not only makes it especially sturdy, but acts as a barrier between the blades and your face. The Ardrone is designed specifically to be a flying photographer, with a 720p 30fps HD camera equipped with a 92 degree diagonal wide angle lens. However, early adopters have also used the camera to other purposes, like turning the copter into your very own personal hunter-seeker. The Ardrone Parrot retails at $300. Based on anecdotal evidence from hobbyists and hackers, this is likely the most popular quadcopter on the market. It has its own dedicated fan site, something I couldn’t find for any of the other models. It’s also drone evangelist Forman’s preferred copter. The Chinese-manufactured Phantom is especially popular with photographers, who have latched on to the copter’s out-of-the-box ability to carry a rugged GoPro camera for aerial photography. 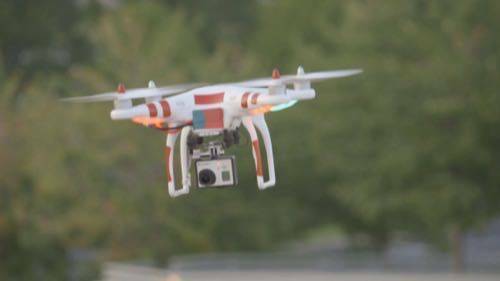 It can hover in a static position to take steady shots from the air. Also, unlike most other copters which come in parts, the Phantom ships ready to fly without needing more than basic assembly. The DJI Phantom retails for $679, but there’s an Amazon Prime deal for $479. Consider this nanobot if you’re more interested in stunts than aerial photography. Capable of doing 360 degree spins in midair, this tiny copter is among the most agile around. The tiny MicroDrone is capable of some truly daredevil acrobatic moves. It pilots well, but that’s all it does. It’s too light to carry a camera, and too compact to open up and hack. 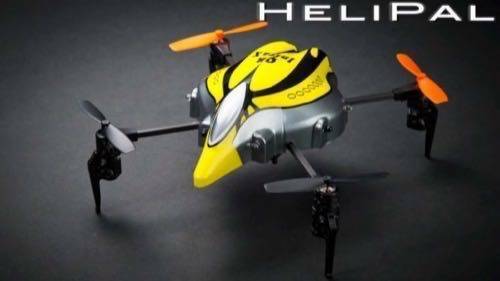 It’s ideal for the person looking for a sturdier version of an RC helicopter toy. The MicroDrone retails for $112.49, not including batteries. The Walkera at rest, balanced on tiny feet. At first you might be skeptical about this copter, after reading its retailer’s broken English description. But if the videos are to be believed, this Walkera model is artificially intelligent enough to avoid crashes with walls, people, and more. This copter is equipped with infra-red sensors that don’t just let it avoid static objects like furniture, but moving targets like people. Since it’s tiny and crash-resistant, it’s ideal for indoor flying. It can even climb stairs by sensing the next step, and hovering to avoid it. It also has tiny “feet” that aid smooth landings. The Walkera QR Infra X Smart Drone retails for $130. Of course, these are just a few of the hobby copters on the market. If I missed your favorite, be sure to tell me about it in the comments. Title photo of DJI Phantom by giovanni on Flickr. All other photos courtesy of the copter’s manufacturer.